The Walking Dead has been the epitome of Telltale's vision of episodic gaming, and Around Every Corner has the particularly difficult task of playing out the penultimate chapter to this: the first of (what we hope to be) many seasons to come. Book of Eli writer Gary Witta leaves his dark signature upon the piece, tackling child endangerment, burying the dead, and a society where the idea of "survival of the fittest" is taken to inhumane lengths. But the one question remains: does this setup make for an episode that lives up to the finely tuned creations of past? The word 'filler' gets thrown around a lot. Describing many situations where a story is purposefully stalled to prepare the audience for a grand finale. Hell, the very TV show that this game shares title and setting with is just as guilty of it when the group of survivors entered Hershel's farm. The tricky situation behind such a tactic is maintaining the familiar pace, which is something that many fail upon. Around Every Corner both succeeds and fails, as pacing is more mixed then before. With a higher focus upon action scenes in this episode, quicktime events are more of a regularity in this, gradually becoming a slight inconvenience. But this doesn't detract from the very beauty that The Walking Dead has possessed: the emotionally charged writing, the amazing dialogue shared between characters. This construction of an all round caliginous atmosphere is one that you can't help but become immersed into. 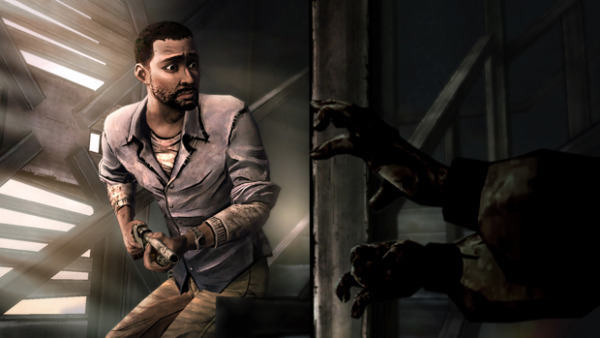 The superbly realised bond between Lee Everett and Clementine instantly becomes a crucial element to the player, like it has previously with our adoration of this growing relationship between the two; but this time with the realisation of it being one of our protagonist's final grasps on humanity. The conversations shared by these two are some of the most heartbreaking dialogue exchanges in the series, and will have you feeling one of two very strong forms of guilt depending on the choices you made. After the tragic events of the previous episode, it's not surprising to see the aforementioned humanity slip away in the face of desensitization to the bleak landscape of the world and the ever dwindling hope of there being anyway back to normal from this. As a familiar face is spotted having his insides rabidly digested by a dozen walkers, Lee simply has a calm moment to mourn and appreciate the man he was before walking away; a far cry from the shocks exuded in episodes before. It's a new air to our leading characters, and one that is especially identifiable in Mr Everett and Kenny. This makes our three central characters really easy to become emotionally engaged with, as they carry the story. It's just a shame that the rest of the game just passes you by without the same amount of recognition. New characters come and go before you have any real connection to them, the increased amount of action scenes undermine the subtleties that built up the series' trademark survival tension, and the story seems to walk unnoticed until the final hour, where it returns to the juggernaut that's expected. Although credit to that hour, as it contains the greatest episode conclusion of the entire series. A glimmer of hope built up throughout Around Every Corner, which is abruptly extinguished with a set of events leading to a perfectly executed cliffhanger ending that would be absolutely criminal of me to ruin. It's just a shame that the pacing leading up to this moment and the crux of The Walking Dead, the group-building mechanics, are gone in the face of more quicktime action, leading to it feeling somewhat underwhelming. But as you look through post-game statistics of the choices people made, nobody will be thinking of the negatives. Around Every Corner maybe imperfect; but through its strenghts comes an instalment that effectively draws hope and despair to all new emotional highs and lows, dragging you from pillar to post. It generates an unsurpassed amount of excitement in the player, as what you just saw was the beginning of the end. If there was ever a definition for the perfect 'filler,' this is it. No-one is safe, and I for one cannot wait to see the fireworks. Roll on Episode Five.